Former North Glasgow/Glasgow Kelvin College student, Eddie Wilkie, is about to embark on the experience of a lifetime to study on an international exchange programme in Computing & Engineering Systems at Nanyang Technological University (NTU) in Singapore, one of the world’s most prestigious institutions. This is a huge accolade and marvellous opportunity for this young Sighthill man who left school at 16 with very few qualifications. A practical thinker, Eddie was keen to be out in the workplace, and school held little fascination for him. He had a series of very hands-on jobs (labouring, gardening, warehousing) during which time he became interested in how computers work and earned a reputation as the ‘go-to’ guy for friends and family needing their technology mended. 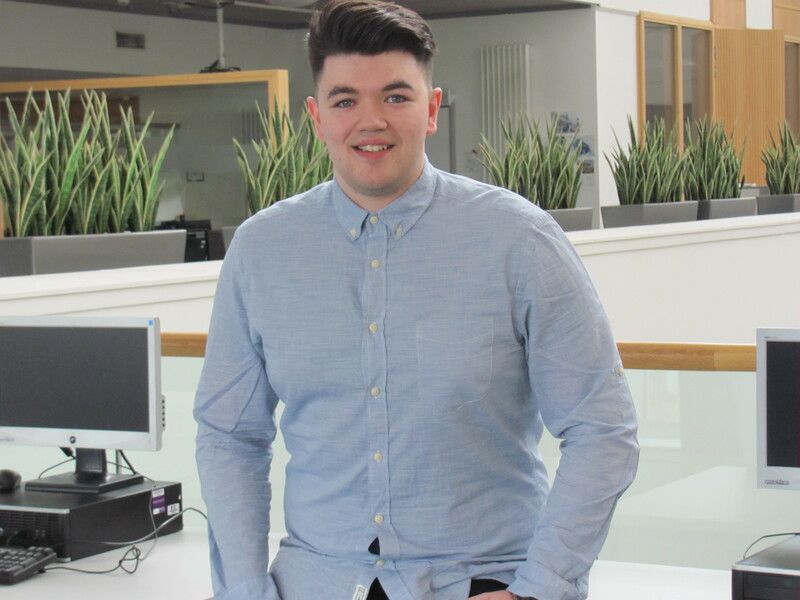 At age 21, he realised he could pursue his interest further and joined the SWAP Access to Maths & Computing programme at what was North Glasgow College, now Glasgow Kelvin, as a mature student. The Scottish Wider Access Programme provides a ‘second chance’ for mature learners and adult returners to achieve qualifications and progress to higher level study or into work. Progressing to a Joint BEng Degree in Computer and Electronic Systems at the University of Strathclyde, Eddie finished his first year with Distinction and was awarded a Dean’s Certificate. After this, Eddie progressed further on and was transferred onto the Masters programme where he completed his second year with Distinction and is now in the process of completing his third year. A clear indication of his enthusiasm for his subjects is borne out by the fact that his studies range across two separate faculty areas (Computer Science and Electronic & Electrical Engineering), both of which require a considerable amount of hard work. He applied for the university’s International Exchange Programme and was delighted to be one of only two students in his year who were recruited for the prestigious Nanyang Technological University, which truly is world-class as it ranks among the global top ten learning institutions. From September, Eddie will spend a year living in Singapore where his packed study programme will include Computing Engineering studies plus classes in Electrical Engineering. He’s very excited as this will be a whole new experience – new city, new culture and a different way of thinking. And just in case he should find spare time on his hands while in Singapore, he is also in the process of lining up a job interview with a global innovative design and manufacturing corporation! In the meantime, he has been offered a two month, BP summer research internship at Strathclyde University. On his return from Singapore, Eddie will complete the final year of his Masters degree and his career plans potentially have an international focus. Ultimately he hopes to work in a senior technical role in a global organisation as he is very flexible and keen to travel. Certainly his time in Singapore will stand him in good stead when it comes to competing for top technical jobs in an international market. “Coming to college has changed everything. If I hadn’t done the Access course then I wouldn’t have gone to university and have no idea where I would be today. “This is all part of my five-year plan. Everything started to come together when I was on my Access course at college and its impact can’t be under-estimated. “I’ve been invited back to Glasgow Kelvin College to talk to Access students and I’m really looking forward to that. Hopefully I can encourage students to want to achieve more and let them know that, if I can do it, they can too. Glasgow Kelvin College hopes that, in years to come, Eddie will return once again to the College to share his story with students… but we would understand it will only be if he can find the time in his exciting global career!